​An Italian artist has contrasted America’s favorite cartoon family with the 20th century’s most infamous tragedy in order to make a statement on the anniversary of the liberation of Auschwitz concentration camp in Poland. A new series of drawings from artist Alexsandro Palombo has been released in tandem with the 70th anniversary of the shutdown of the Nazi prison facility. 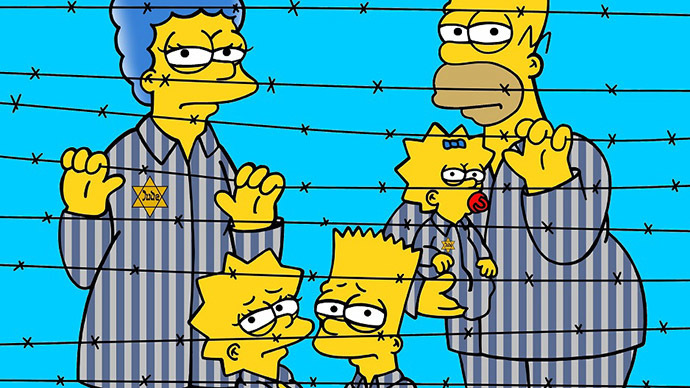 In it he revisits the horrors of Auschwitz – not with images of emaciated Jewish inmates, but with The Simpsons. The images – colorful depictions of the iconic cartoon family and one of the world’s most recognized casualties of the Holocaust – are intended to make a statement, according to the artist. "We must educate the new generations and tell them what happened. We have to do it without filters, bluntly, over and over again, through the memory of facts and terrifying images that reflect the horror of the Holocaust and the extermination of millions of human beings," Palombo told the Jerusalem Post. "It is only through memory that we are able to fight racism, anti-Semitism, homophobia and all forms of intolerance that threaten the society," he said. January 27 marks 70 years since the notorious Nazi camp was closed towards the end of World War II, but not before the Holocaust claimed the lives of an estimated 11 million people, mostly Jews. Palombo made headlines last year when he released a series of iconic animated females sporting bruises and black eyes to mark International Day for the Elimination of Violence Against Women.